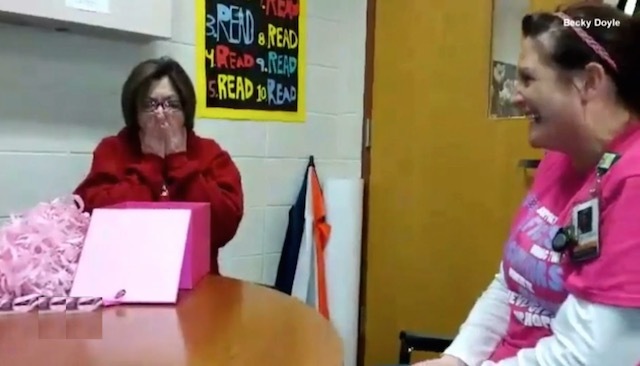 An emotional video reveals the moment a grandmother finds out that her 8-year-old granddaughter will finally get the new kidney she desperately needs. But who is the surprising donor? Grandmother Chris Burelton thought she was being called in to the principal’s office because the child had done something wrong. But she learned that one of the teachers in the school – a woman who reportedly hadn’t even taught the young girl – volunteered to be a donor and was a match. Third-grade teacher Jodi Schmidt, if all goes well, will be forever linked with Natasha Fuller from now on. The first grader was diagnosed with prune belly syndrome at birth, causing her to need dialysis three times a week. Because of various infections, she was repeatedly taken off the transplant list.